Long before there was a movie by the same name, people everywhere questioned what elements make up ‘the perfect storm.’ Here in Arizona, I have a very simple answer. Following a glorious Saturday St. Patrick’s Day–by the way I finally stopped eating shepherd’s pie and corned beef and cabbage leftovers on Thursday–we were treated to a ‘perfect storm.’ The cold front that developed in the Northwest and California delivered precipitation and unusually cool temperatures to us on Saturday night. 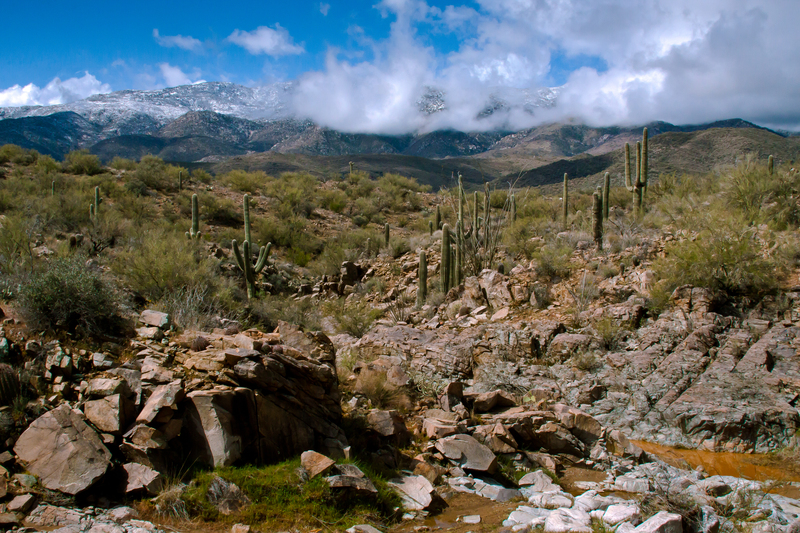 Rain and intermittent snow continued through Sunday and Monday with crashing snow levels in Arizona’s mountainous terrain. 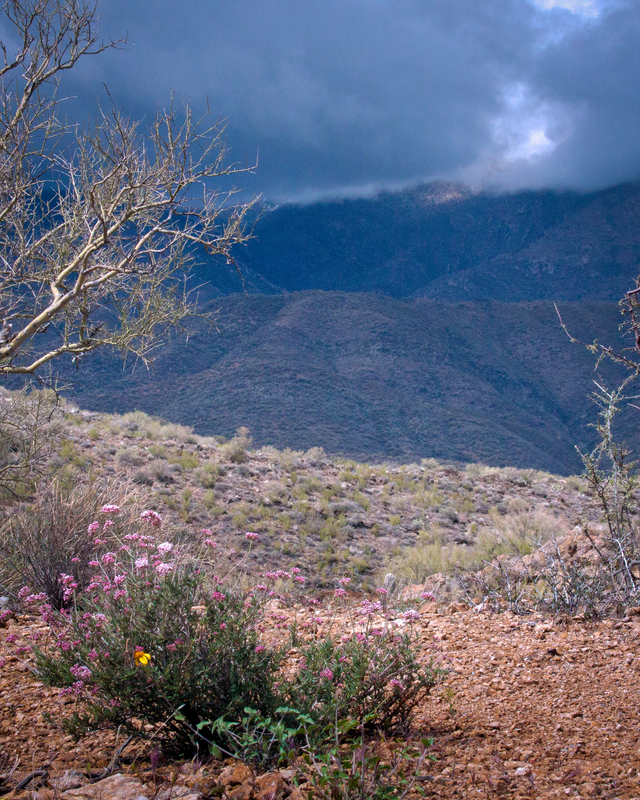 Eventually some of the snow, mixed in with a surprisingly generous sprinkling of tiny lumps of hail, came to outlying areas of the lower Sonoran Desert. 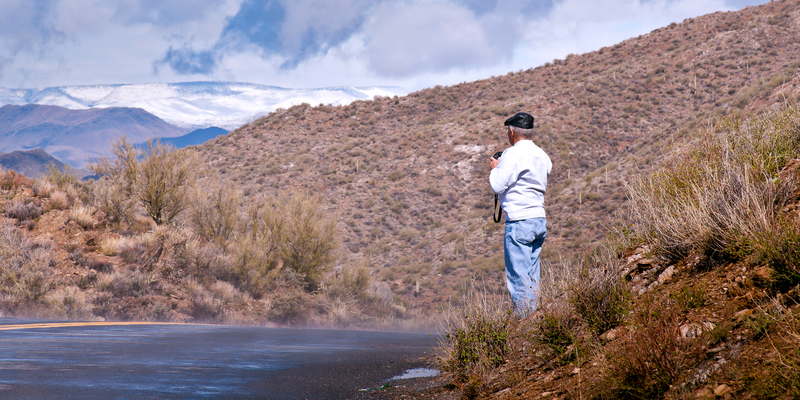 Seeing the beautiful dusting of snow on the mountains that surround most of Anthem and New River, my neighbor and good buddy Ed and I grabbed our camera gear Monday morning and headed out for delightful photo-remedy. 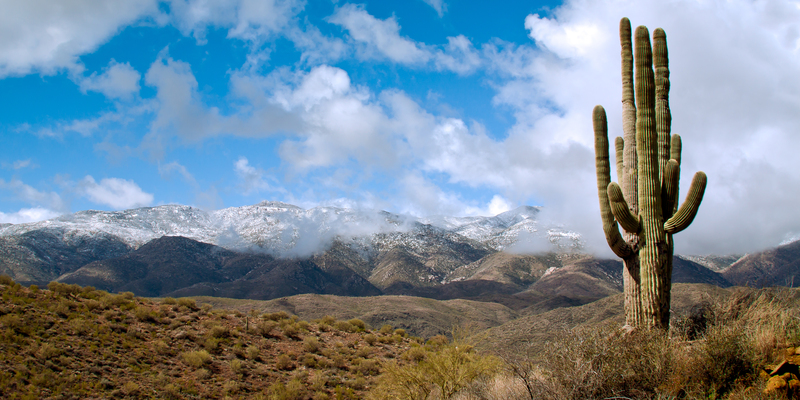 Just outside of Black Canyon City, we encountered the developing white blanket of nature. The saguaros appeared to be raising their arms in a strange battle cry silently shouting, “You’ll never win.” Even the wildflowers seemingly sported a strange air of arrogance and wisdom, knowing they had a weapon (the sun) that would most assuredly smack down anything the north could throw at them. 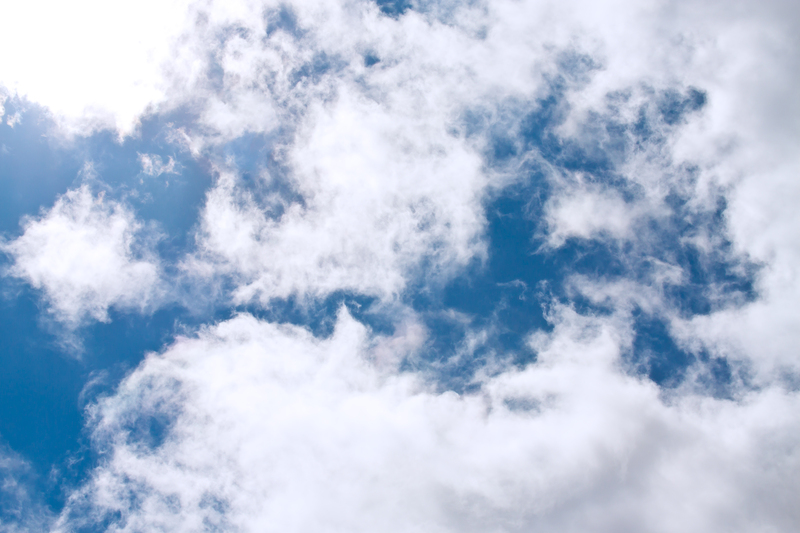 By Thursday, our temperatures were back into the 70s and rapidly heading to the 80s. This is glorious, familiar territory for me. I will, however, remain thankful that even in the desert mother nature has the ability to occasionally wrap her gifts in white. It’s a great reminder for all of us. Nothing in life is guaranteed. And, the minute we think it is, new enemies and new battles will eventually surface. Let us never forget that we can also emerge victorious. After all, we have the Son! Beautiful photos and great words, Greg. Thanks, Emily. It means a lot coming from everyone’s favorite English teacher!! !